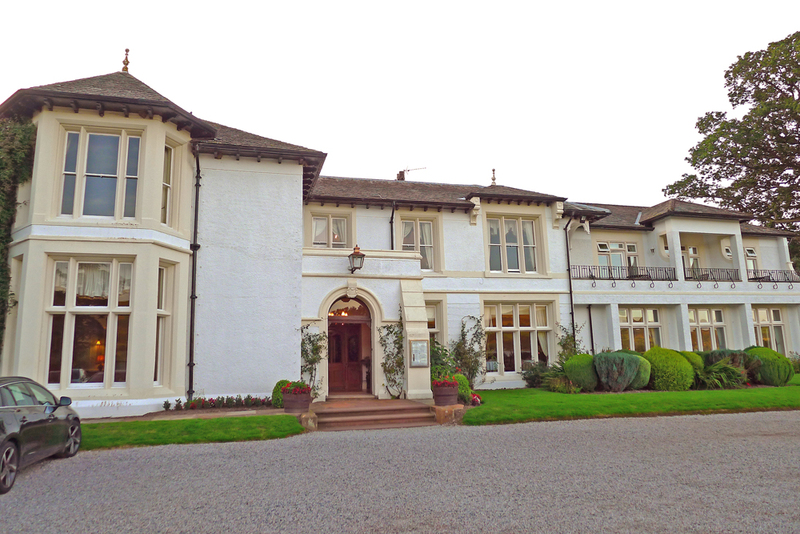 Rampsbeck Country house – Ullswater. The problem that i always encounter when dining out is that basically i`m a total creature of habit. I always seem to go for the places i`ve been to before and where i know i`m going to get well taken care of…..hence all of my repeat visits to the same places. On this occasion it was firmly decided to go somewhere i`d never been to before , somewhere in the lakes and not too far away from home.I made a list of several restaurants and by process of elimination i ended up with my final choice , Rampsbeck country house hotel on the banks of Ullswater.Now the best way to get to Rampsbeck is straight up or down the M6 to the Penrith junction , head off in the direction of Ullswater and within 10 minutes you`ll be driving through the gates. The area`s stunning , the grounds are beautifully manicured and the hotel itself sits back gracefully overlooking Ullswater. The hotel sits almost on the waterside so obviously there`s some totally amazing views out and over Ullswater and the surrounding fells.The area has some breathtaking scenery so it`s well worth a visit for a weekend break.There`s lots of fine country house restaurants within a short drive so it`s a nice area to do a double hit on two of them. The world famous Sharrow bay country house sits almost opposite on the other side of Ullswater so there`s an idea straight away…..Mmnnnn , sounds like a plan. So anyways , Rampsbeck ,a firmly established hotel having been running now for many years.Step through the doors and you`ll be immediately stepping out of your time machine and into the seventies. I didn`t actually ask but i wouldn`t be far off the mark if i said it hadn`t been touched for the last 40 or so years ( in a nice way of course ). Four large lounges , Oil paintings and log fires. Distressed leather Chesterfield suites and the smells and ambience of an old country house make Rampsbeck very appealing for the destination traveller. I can see it being heavenly for the Japanese and American tourist wanting an authentic old English experience. The restaurant has some nice write ups in the various guides , 3 AA rosettes and 4 / 10 in the Good food guide so there`s a decent start. 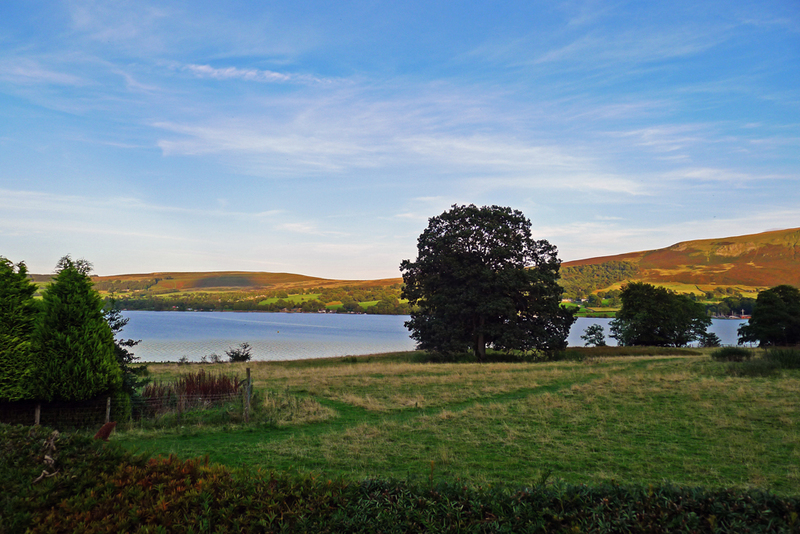 The rooms are well priced and a double room will set you back £59.95 per person inclusive of breakfast for an overnight stay……with a wonderful view over Ullswater….a great price for what you`ll be getting. The food here is priced as set meals, there`s no tasting menu which i was very surprised at as most restaurants at this level amost all have a showcase of chefs best dishes over the years.Might be a good idea to think this one through chef , could be some extra little plus points for the future guides. 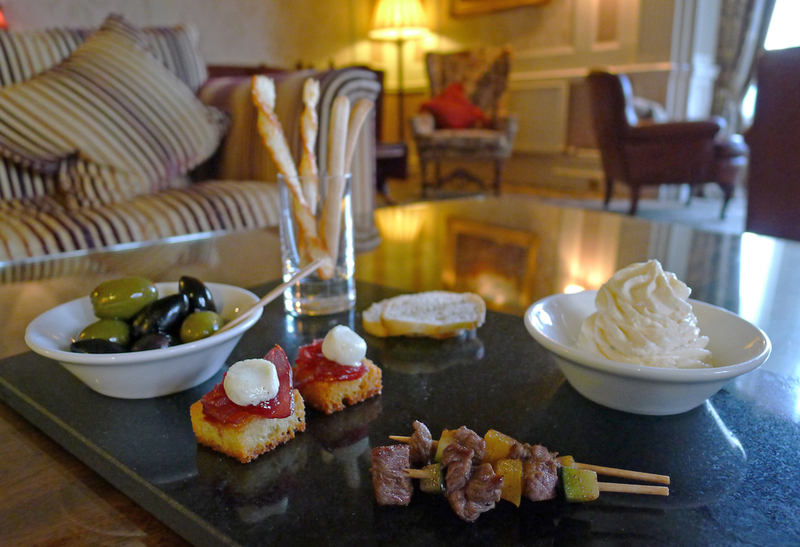 Amuse bouche ( canapes ) arrived with the menus , nothing ground breaking here but they served their purpose well , Lakeland lamb skewers ( cold ) Olives , and a couple of dippers to load up with some creamy Salmon mousse. 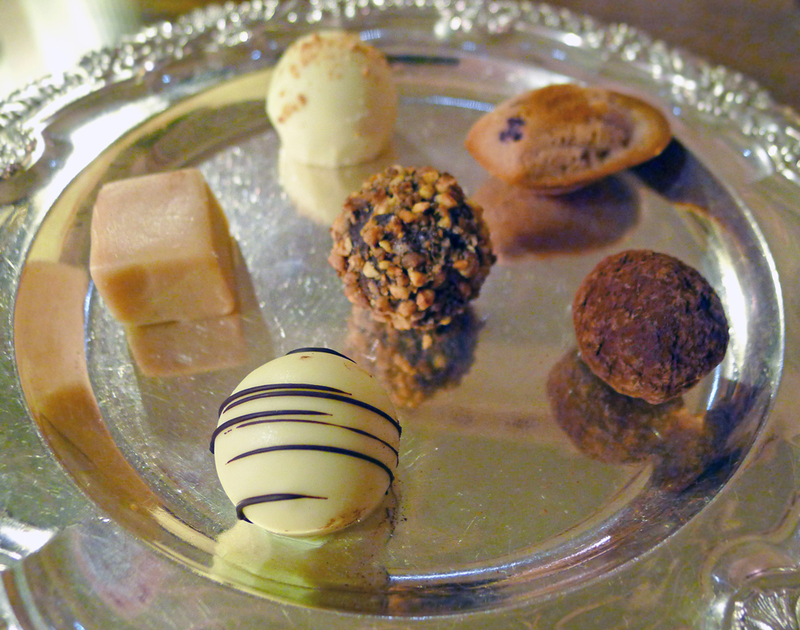 We chose to have the £ 59.95 set menu which consisted of 4 courses and canapes / petits fours and coffee inclusive. Several choices of starters , mains and puddings made it quite a difficult task to whittle down. Choices were made and here`s what we had at Rampsbeck. Sweet potato soup with Coconut foam. 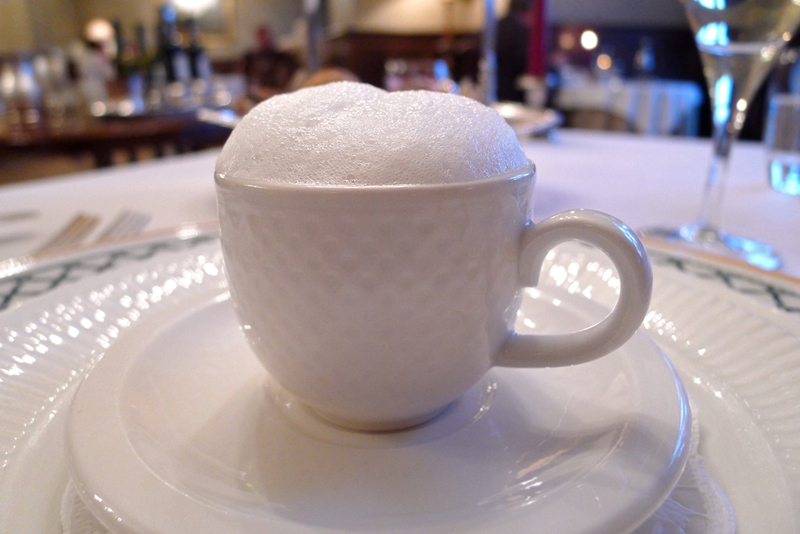 – A fragrant Coconut foam topping off a cream of sweet potato soup. Perfect little portion served up in an espresso cup , Beautiful. Pan fried John Dory with Morecambe bay shrimp risotto and a Lemon grass foam , The John Dory was well cooked but let down by the Risotto which was a bit on the watery side. I would have preferred a much more creamy rice with more robust flavourings to complement the fish more. 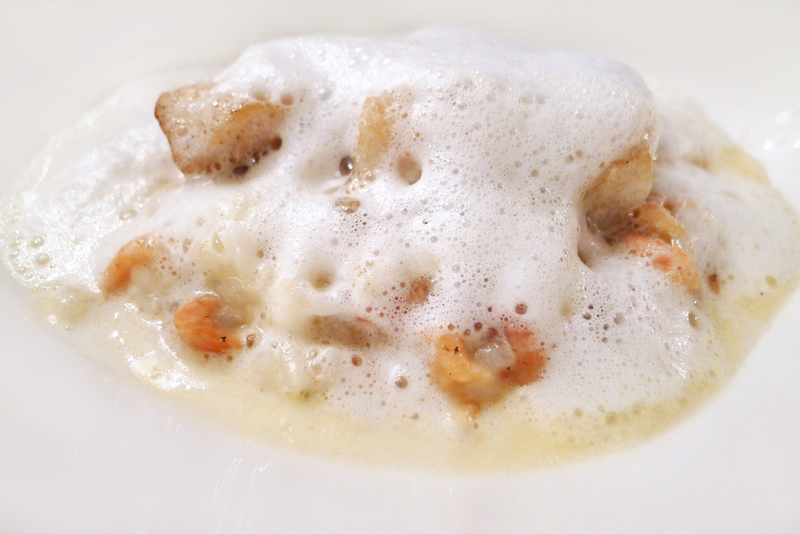 Delicate little Morecambe bay shrimps studded the Risotto which was topped off with a Lemon grass foam….a bit too much foam as it prevented me seeing the beauty of the other ingredients. 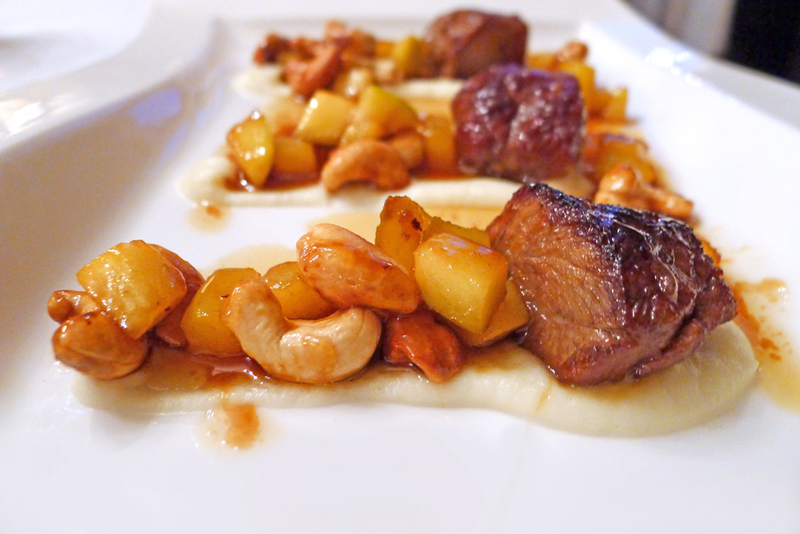 Braised Pigs cheeks with Caramelised Mango and Cashews. 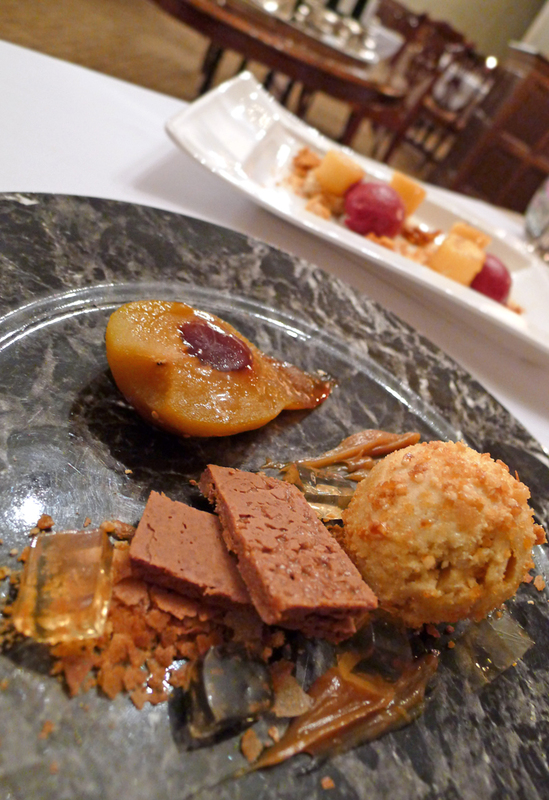 – The star dish of the evening but my dining partner beat me to choosing this one. Being forever the gentleman i ordered another starter and we `done a deal` on a wee taster. The braised Pigs cheeks were cooked long and slow , very tender , full of flavour and served up in a reduction of their sticky cooking juices. Caramelised mango and Cashews were definitely on the sweeter side of things but i loved the flavour combination and it was definitely my star dish of the meal….even though i was only allowed `one` fork full…..pure tightness. 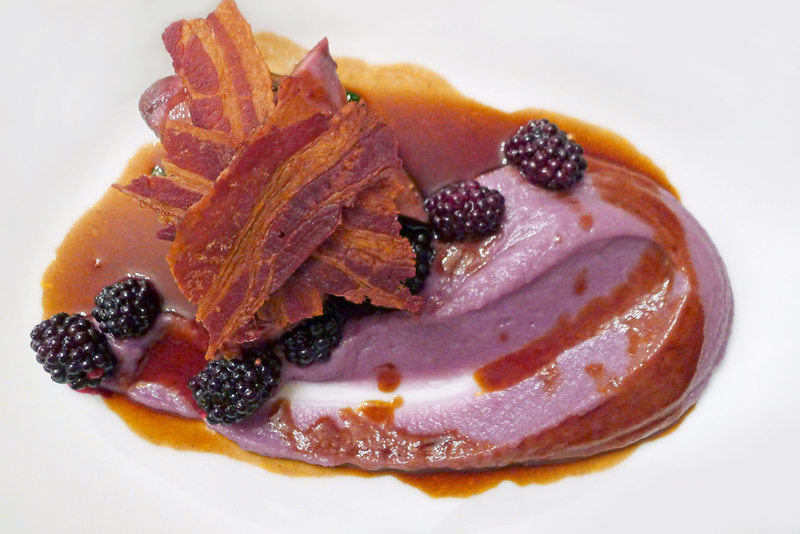 Young Grouse , Purple potatoes , Spiced Blackberries. – The most meltingly tender Grouse i`ve ever eaten , i would have definitely guessed that it had been cooked `sous vide`but im sure it said oven roasted on the menu. …whatever , it was definitely a young bird as it didnt have the matured taste of an older specimen plus it just melted in the mouth. 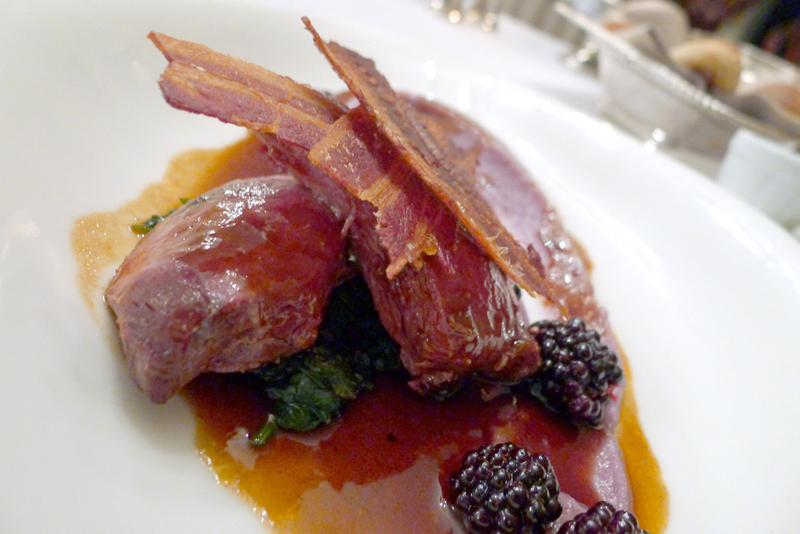 Spiced blackberries , spinach and roasting juices made it a very pleasant experience “old school ” style.The purple potato puree needed refinement as it carried virtually no flavour….butter, salt and pepper would have made a world of difference. 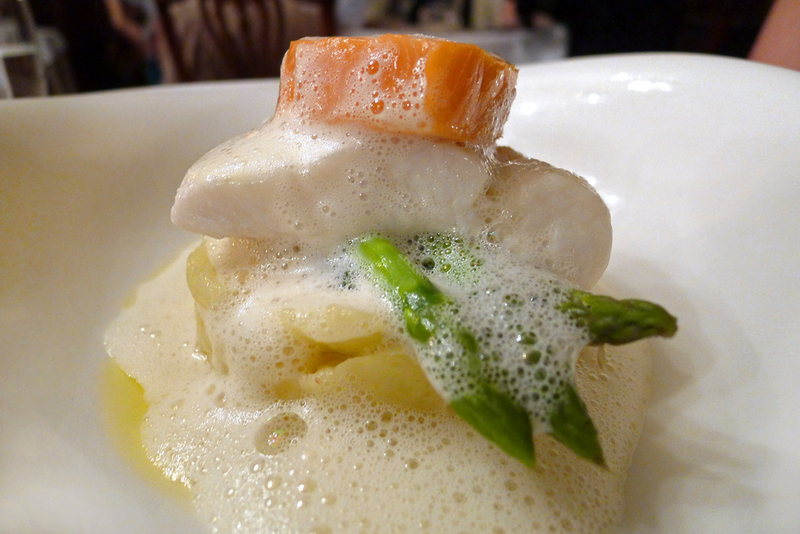 Halibut , Salmon and asparagus…..with another foam. 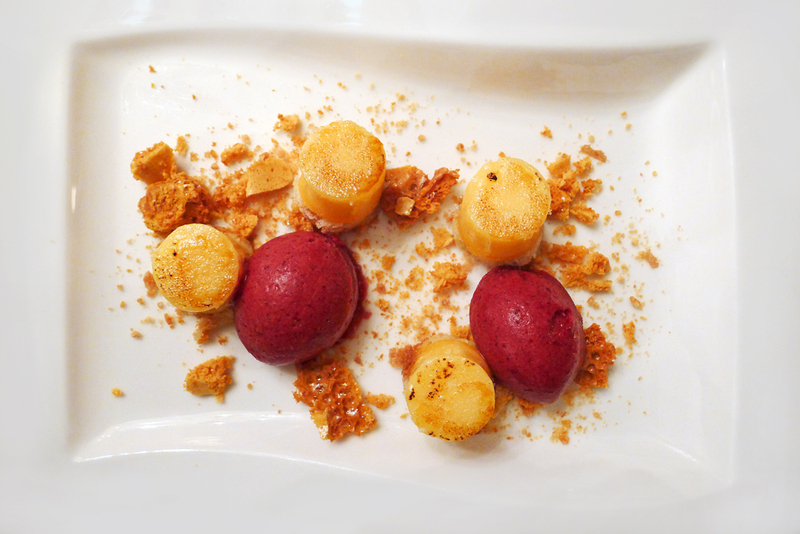 Creme brulee , Orange sponge , honeycomb – Creamy,delicate , lots of taste and hit the mark perfectly. 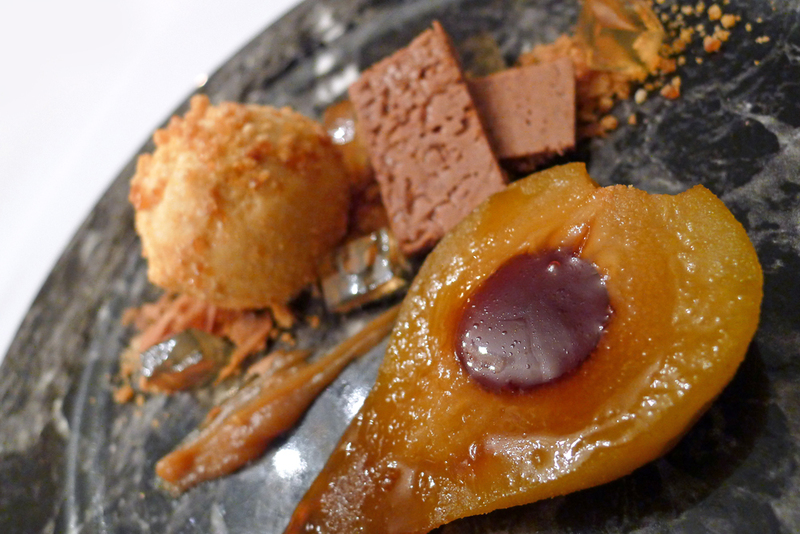 Caramelised poached Pear , Croissant ice cream , Rum gel. 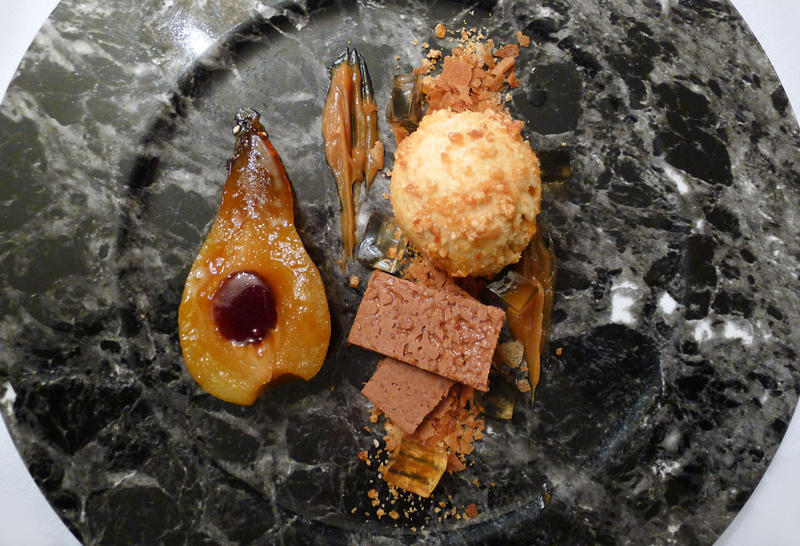 – Quite amusing this one , ice cream that tastes of Croissants , a nice novelty idea that worked well with the Pear. 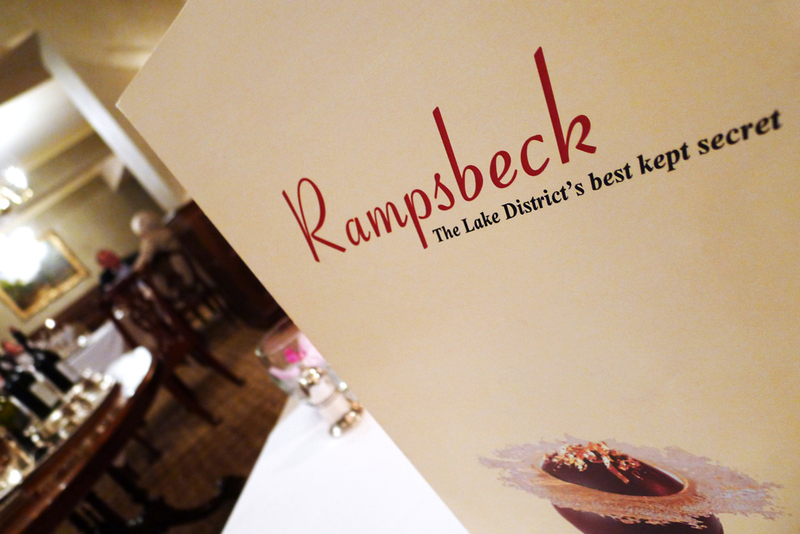 There`s also a tasting of Rampsbeck ice creams and sorbets available as an alternative dessert choice. Some cracking flavours as well and all made in the kitchens putting their Gelato machine to good use. – By the time we finished our meal the restaurant was empty. I had observed upon our arrival at 7.15 that almost all of the guests were already seated and on their starters.By the time our desserts arrived we were virtually on our own. By the time we went for coffee in the lounge we were the only guests left in the place , 4 big lounges totally empty, everyone had disappeared to bed so obviously the Ullswater air combined with the hotel food takes its toll on the sleepy hormones. I was tempted to book into a room for the night but the hotel was full. Obviously in the height of our current economic climate the Rampsbeck people are doing something very right indeed. Personally i would have made a few tweaks here and there but there again, “If it aint broken then why try to fix it”…The machine works perfectly giving the customers exactly what they`re wanting….and the diary reflects just that , booked solid throughout September. best cumbrian restaurantscountry house hotelsgood food guidehotels in cumbriamichelin diningrampsbeck country house hotelullswater hotels. 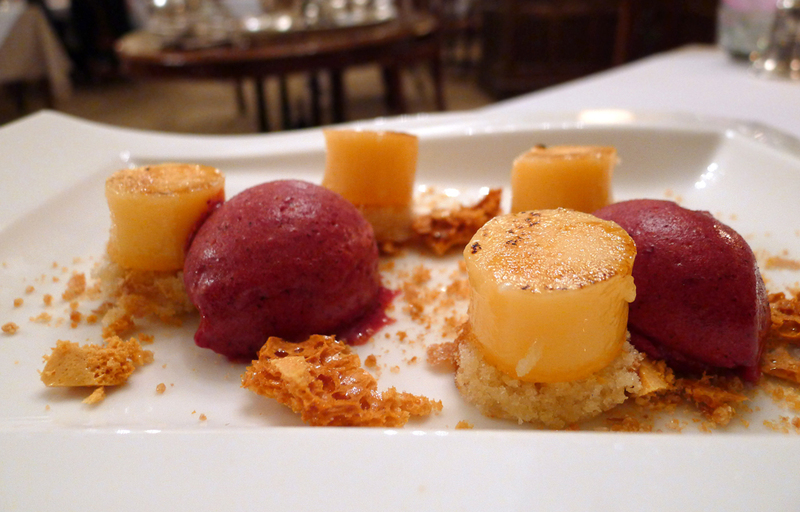 Previous Post THE RITZ , London – More Stunning food , Wine and James Bond. Next Post The Waterfront – Whitehaven and my home town Gem. Looks great man. Pig cheeks, damn my favorite! Really should do a evening in London Alan! Really curiuous about Marcus’s restaurant. Later!